Be the first to share your favorite memory, photo or story of Rade. This memorial page is dedicated for family, friends and future generations to celebrate the life of their loved one. 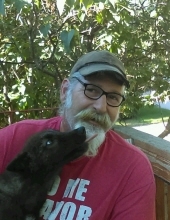 Rade Michael Proulx, a resident of Fenton, and long time employee of Wright Tree Service, died at his home on February 5, 2019 at the age of 64. He was preceded in death by his son, Brian Proulx, and is survived by his wife, Tina; children, David Kinney, Steve (Angela) Proulx, Crystal (Matt) Esper, Megan McIntosh, Melissa (Mike) Juka; grandchildren, Nikole Kinney, Trevor Proulx, Hailey Proulx, Paislee Esper, Seth McIntosh, Breanna Klem, Logan and Lawson Esper; great grandchildren, Neveah, Kayden, and Alyssa; sisters, Ann O’Connell and Renee Zani; brothers, Ron Proulx and Robert (Denise) Proulx; father-in-law and mother-in-law, Bradley and Linda Brewer and many nieces, nephews, and dear friends. A Memorial Service will be held at Lynch & Sons Funeral Home, 404 E. Liberty St., Milford, on Saturday, February 16, at 2PM. Friends may gather from 1PM until the time of service. For further information please phone 248-684-6645. "Email Address" would like to share the life celebration of Rade Michael Proulx. Click on the "link" to go to share a favorite memory or leave a condolence message for the family.